Crimson Trace LTG-736 Lightguard for GLOCK Full Size and Compact FREE SHIPPING! 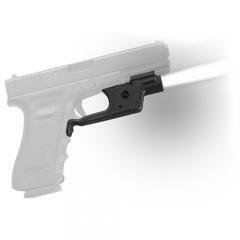 Eliminate the need for a flashlight with the Crimson Trace Lightguard for full-sized and compact Glock pistols. Ideal for concealed carry, the design seamlessly integrates to the form and contours of Glock firearms without interfering with holstering. The pistol-mounted light fits securely around the trigger guard and includes everything required for a quick, safe fit without gunsmithing. To operate the Lightguard, simply hold the pistol and the light activates instantly with a powerful 100-lumen beam. Each model is equipped with a master on/off switch for instances when a target light isn't required. For situations that could require identifying a threat in the dark, count on the impressive illumination power of Lightguard by Crimson Trace. This light is a trade off between a bright light and a slim, lightweight light designed for concealed carry. It is bright enough to illuminate your target and is perfect for what my needs are. ©2002-2019 CopsPlus.com: Crimson Trace LTG-736 Lightguard for GLOCK Full Size and Compact FREE SHIPPING!